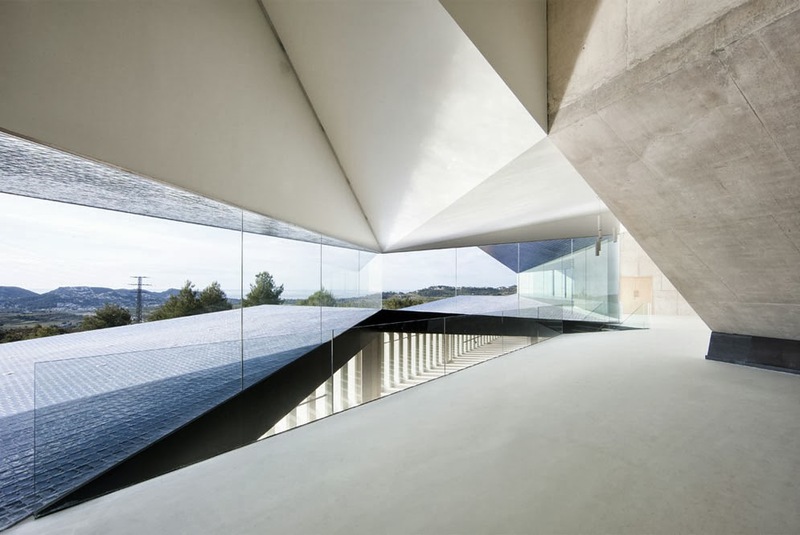 Few days ago our friend and artist Josep Ginestar exhibited his work in the "III Muestra de Enoturismo y Gastronomía" and it was the perfect excuse to visit the Auditorium of Teulada, a new example of contemporary architecture in our region. The building was designed by Francisco Mangado an architect from Navarra. It has 5.100 sqm and it was finished in 2011. The auditorium is located in the highest point of Teulada from where it can be seen the town of Moraira, right next to the sea. If we continue the natural path to access the building we will meet, in first place, with a hard and inscrutable building that will be opening itself towards the sea as soon as we start going into it. Walking from the hall towards the entrance of the main Auditorium room we will start seeing the main façade which is composed by an irregular and abrupt geometry. Through the glass of that main façade we will find the blue ceramics used in the building to link it with the sea. We will also find the angular geometry used in the south-east façade in the main Auditorium room. 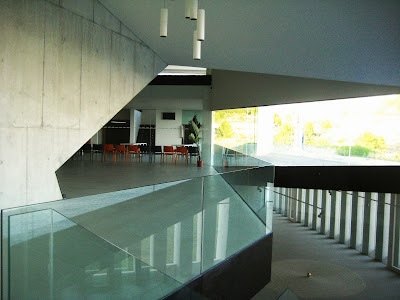 This is the main space of the building and it has been illuminated by elegant light panels placed in the lateral walls. The unusual geometry the room ensures a perfect view of the stage from any point in the room as well as excellent acoustic conditions. Once we had seen the exhibition that was located in the basement level we had to go out and see the main façade, which had fascinated us, from the outside. The path that led us to the building haven't had shown us that façade and it was now presenting itself as a large theatrical curtain that would be lit at night acting as a lighthouse between the two towns. If you would like to see some of the other pictures that we took in our visit to the building, you can access our Instagram page. I was also visiting the Auditorium Teulada-Moraira, and the most impressive thing for me were the emptiness and the raw materials. The feeling of open deepness until the sea was contrasted with the heavy weight of the huge materials that were creating the space. It was nice to be there!